My progress in the studio this week is going “slowly but surely”…There were some other obligations that had to be taken care of in the past few days and my studio work was on hold. The top of the wall hanging, Above Dark Clouds, has been pieced. 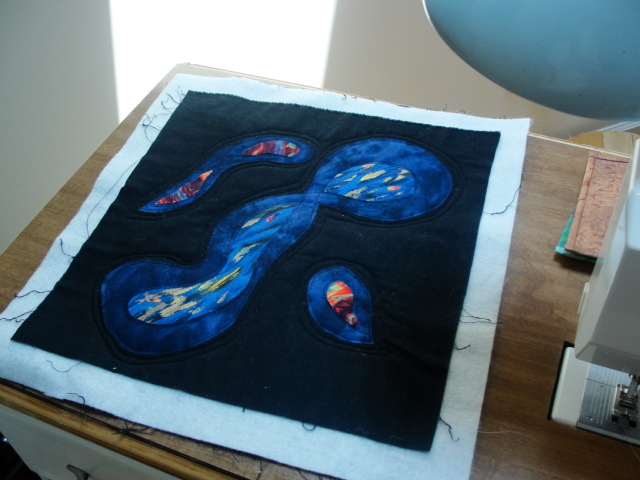 Today I am finishing the appliqué, adding a backing, and then will use quilt lines to add visual texture and dimension to the piece. The inspiration for this piece came years ago when I was flying cross-country to a health center with a family member. I would marvel at the sunshine and brilliant, clear, cobalt blue sky at 40, 000 feet, above the gray clouds, rain, and turbulence—it became a reminder for me. Looking down, away from the everyday challenges like work, life, and traffic—it all seemed so much smaller than when I was on the ground. In life there are times of stormy weather—with dark clouds. 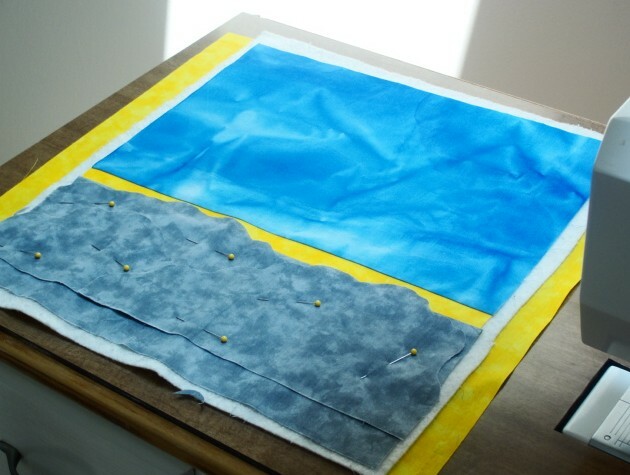 Sometimes it is difficult for me to remember that no matter what, there is always sunshine and a brilliant bright blue sky above it all…To finish this 12” art quilt a sleeve and label will be added. 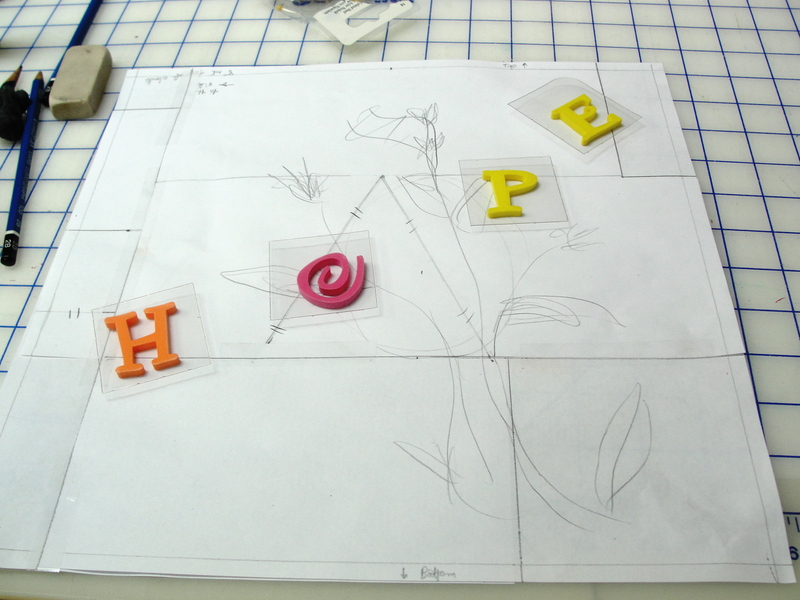 New work is being begun on another 12” wall hanging–it is only in the idea stage. 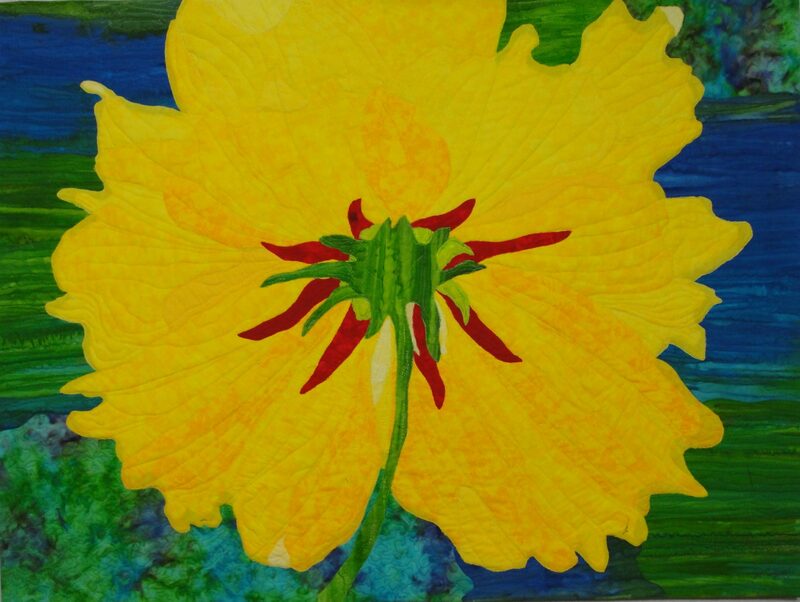 After creating a couple of pieces, I need to decide which art quilt to donate to the SAQA Benefit Auction..., and since time is running very close to the deadline, it must be mailed very soon! 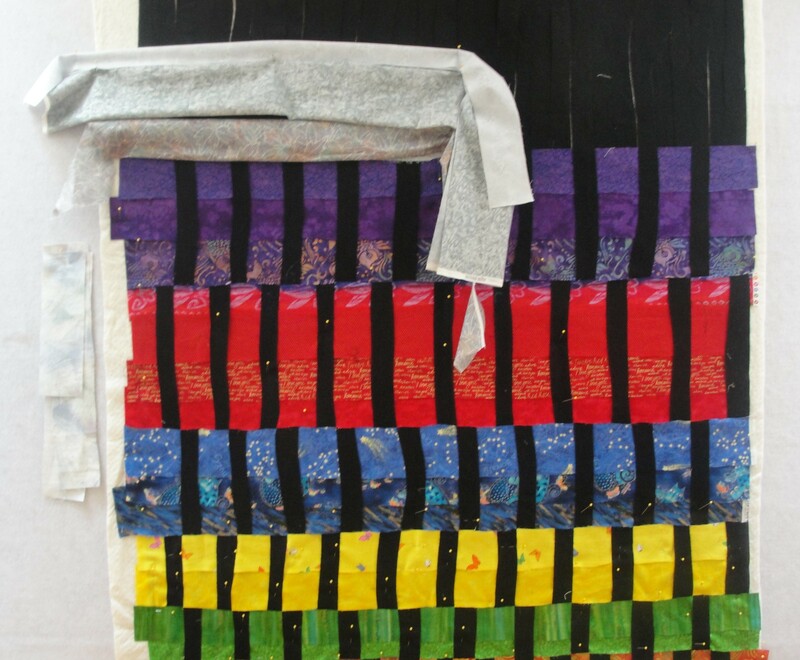 Among other works in progress is the Lifeweaving #3 piece–the silver strips that represent the late adult life stage (ages 60-mid 80s) are being woven. The next step is to baste the weaving together and layer the top, batting, and a backing. I once heard someone say that creative people usually have more than one project they work on at a time, so maybe all of these unfinished pieces are not a bad thing! But, I guess it is time to put away the camera, turn off the computer, and get busy in the studio… where progress is going “slowly but surely”! *Do you ever seem to procrastinate, finding anything to do other than begin working? Do you think this serves some purpose!? I always have several artworks going all at once. I feel my creativity in different ways everday. Sometimes, I don’t feel creative at all. That’s when I decide it is time for my rest day. Good luck with completing your quilt.